Terang, a rural town on the Princes Highway, is 40 km north-east of Warrnambool, western Victoria. 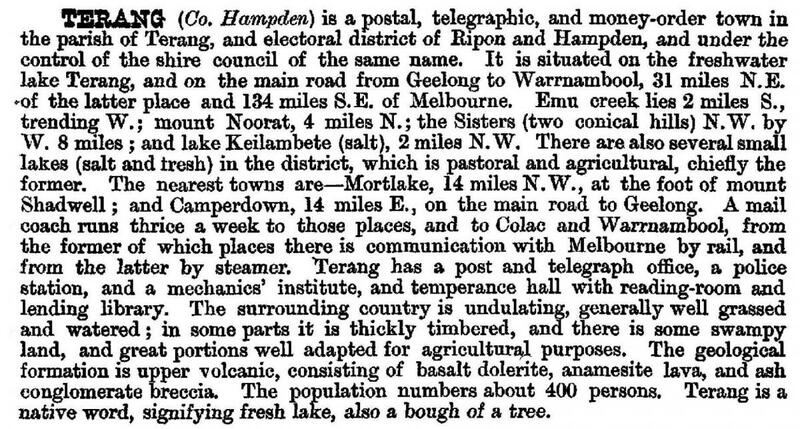 Terang adjoined the Glenormiston pastoral run (1840), and an employee of the run built a slab hut beside Lake Terang. (The lake has had varying water levels, and lies beside the Terang golf course. For much of the nineteenth century it contained water). The slab hut led to a small settlement and in 1858 a township was surveyed and a school was opened. 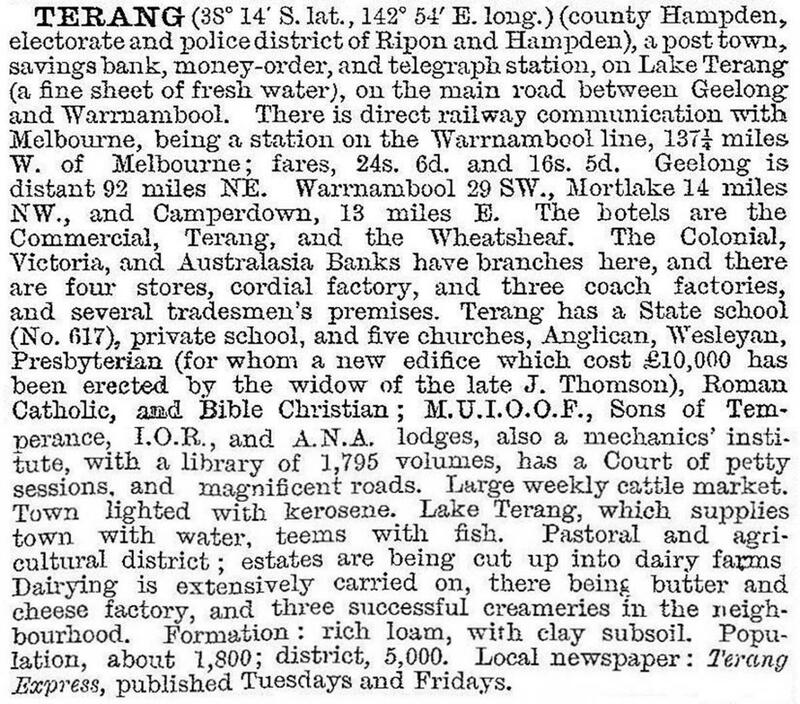 The gazetteer noted that Terang had a post office, a mechanics’ institute and two hotels. During 1890-1910 several of Terang’s notable public buildings were constructed: the Thomson memorial Presbyterian church (1894), loosely modelled on Scots church, Melbourne; Anglican and Catholic churches (1898); a massive grandstand at the racecourse (1898); a new post office (1902) and public hall (1908), both of ample proportions; and a Catholic school and convent (1907-10). In 1927 a State higher education school was opened, and in 1936 the Norah Cosgrove Terang and District Community Hospital was opened. Terang had several large stores in its shopping area, including a branch of Bright and Hitchcock’s (Geelong) and its own Terang Cooperative Society department store. The Co-op’s store was rebuilt in 1945. During World War II several properties grew flax which was processed at a mill in Terang until 1947. There was further growth after World War II when the Marida Yallock estate east of Terang was subdivided for soldier settlement and a Housing Commission estate in the town was completed. A high school was opened in 1950. Terang’s postwar population fell from a high of nearly 2400 people (1960s) to about 1850 in the late 1990s. It has nevertheless maintained a full range of town facilities, including three hotels. The Terang Express, however, is published by Western District Newspapers at Camperdown and the Glenormiston butter factory closed in 1974. Terang has State primary and secondary schools, a Catholic school, a hospital, a golf course, a polo field, a racecourse, a trotting track, a sport and recreation centre, a swimming pool, a motel and a caravan park. The post office (1904), Presbyterian church, the railway station (1889) and the Marida Yallock homestead (1854) are listed on the heritage register. Marida Yallock also has notable gardens. The main street includes a tree-lined reserve, with the war memorial (1923) at the east end and the Presbyterian church at the west end.